For the last several weeks, activists all over the world have been mobilizing against the EU’s proposed Directive on Copyright in the Digital Single Market, and the threats it poses to internet freedom and civil liberties, specifically through Articles 11 and 13. This mobilization is working under a couple of different names, including ‘Save Your Internet’ and ‘Stop ACTA2’. Organizers come from all walks of life and many of them are Pirates, in some cases representing and working through their national parties, in other cases working independently or with other digital and human rights groups. Some are affiliated with Anonymous. Many are simply concerned citizens. 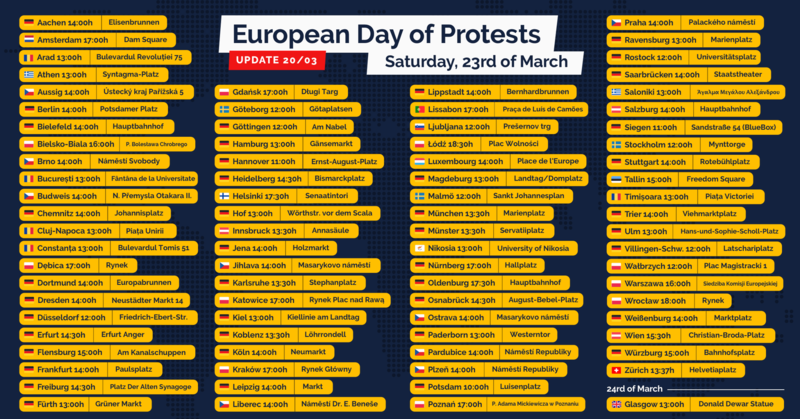 Pirate Parties International (PPI) wholeheartedly supports all efforts to fight back against the EU Copyright Directive, and we stand in solidarity with everyone taking the streets on the 23rd, including our own members. We recognize the diversity of ideas and tactics within these efforts and whether you are participating under the Save Your Internet banner or Stop ACTA2, we all have one collective goal: Stop Articles 11 and 13 from becoming law. 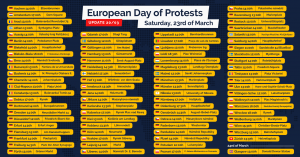 PPI encourages everyone to not only go out and protest this Saturday, but to also visit and/or contact your MEPs directly and tell them to vote against the Copyright Directive as it stands. German Pirate Party MEP Julia Reda recently set up this website, where you can check which MEPs have pledged to vote No, and how to contact those who have not: //pledge2019.eu/en. You can also find this information here: //saveyourinternet.eu/act/. It is an election year in the EU, so now is a good time to tell your MEPs that if they do not defend the Internet, they will not have your vote! Here is a map where you can find a protest near you this Saturday: //www.google.com/maps/d/viewer?mid=1tHaOiCgjION6hK0rrajIJyuHnG5FgBzH&ll=50.377021008976385%2C21.746723867961123&z=4&fbclid=IwAR26FpLf_NQGKNfJEZ8pTPxDw-wEk-TE4cmjM5E9m-ZBzhynq7hP0gkTPoA. As of right now, 87 local events have been registered. Lastly, for more information about the Copyright Directive, Articles 11 and 13, and regular updates about what is going on in the EU parliament with regards to this, keep an eye on Julia Reda’s website: //juliareda.eu/en/. Let us not be indifferent when our freedom is under threat, online or offline. We need Pirate Party in Asia.